UNSD collects energy statistics from more than 200 countries and updates and maintains the Energy Statistics Database, which contains energy statistics for the period 1950-2016. The statistics cover production, trade, transformation and final consumption (end-use) for a range of primary and secondary energy products derived from conventional and non-conventional or renewable energy sources. The UNSD Annual Questionnaire on Energy Statistics is sent every year to national statistical offices, ministries of energy or other authorities responsible for energy statistics in the country. The Energy Statistics Database covering the period 1990-2016 is also available in non-aggregated format on-line through UNdata. The annual publication Energy Statistics Yearbook is a collection of international comparable energy statistics on the supply of primary and secondary forms of energy. 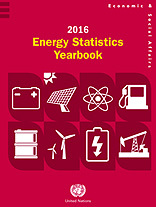 The 2016 Energy Statistics Yearbook is now available on-line! The annual publication Energy Balances presents energy data for countries and areas in an energy balance format showing the total picture of energy production, transformation and consumption of energy products. 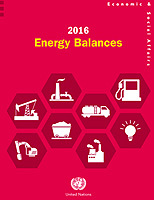 The 2016 Energy Balances is now available on-line! The annual publication Electricity Profiles presents electricity profiles for countries and areas, showing information on production, trade and consumption of electricity, on net installed capacity and thermal power plant inputs and efficiency. 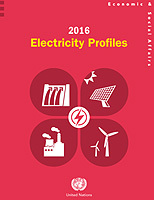 The 2016 Electricity Profiles is now available on-line! The annual publication Energy Statistics Pocketbook highlights the availability of data on various aspects of energy production, transformation and use and its linkages to other key statistics. The 2019 Energy Statistics Pocketbook is now available on-line! Previous editions of these publications can be found here. Statistics on the production of hard coal, brown coal, crude oil, natural gas and electricity are collected on a monthly basis and are available from the Monthly Bulletin of Statistics Online. Aggregated data on annual production, trade and apparent consumption of primary energy products are also published in the UNSD Statistical Yearbook. UNSD is also involved in the Joint Organisations Data Initiative (JODI) with the Asia Pacific Energy Research Center (APEC), EUROSTAT, the International Energy Agency (IEA/OECD), the Latin American Energy Organization (OLADE), the Organization of Petroleum Exporting Countries (OPEC) and the International Energy Forum Secretariat (IEFS). The JODI world database can be accessed at http://www.jodidata.org/. UNSD is also involved in developing concepts and methods in the domain of energy statistics to ensure international comparability of energy data and organizes regional seminars and workshops to enhance national statistical capacity building in energy statistics.